. Each of the designs are created by printing the designs on fabric and then hand shading all of the colors along with the outline. The end result is beyond description. The watercolor backgrounds add a dimension to the designs that would not be possible with thread alone. If you are not inclined to print the fabric, you can skip it and just use the stitches – the designs still look amazing. Once we were finished designing the animals, we added two different versions of frames – a simple folded fabric frame and an ornate stitched frame. There are also transitional blocks included. Since the designs are Mix & Match compatible, you can create a quilt by using multiple designs, or frame individual blocks as works of art! This collection took months of planning and about 4 different revisions of the artwork. The idea was to paint watercolor portraits of our group of Playhouse characters all grown up. We were then going to print them on fabric, use the fabric as appliqué, and then stitch the outlines. The paintings were revised a few times, and then we experimented with the stitching for about a month. Each of the designs are created by printing the designs on fabric and then hand shading all of the colors along with the outline. The end result is beyond description. The watercolor backgrounds add a dimension to the designs that would not be possible with thread alone. If you are not inclined to print the fabric, you can skip it and just use the stitches – the designs still look amazing. Once we were finished designing the animals, we added two different versions of frames – a simple folded fabric frame and an ornate stitched frame. There are also transitional blocks included. Since the designs are Mix & Match compatible, you can create a quilt by using multiple designs, or frame individual blocks as works of art! 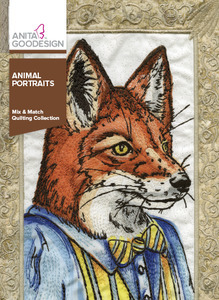 18 different portraits and 6 transitional blocks in 2 versions each: folded fabric border or embroidered frame (hoop size ranges from 6” x 10” to 8”x 12”). Includes 2 sashing blocks.